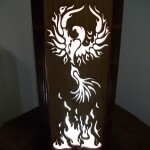 Laser cut phoenix rising rising lamp, shoji style table lamp provides soft, warm light filtered through high quality rice paper filling the room with a welcoming, relaxing glow. 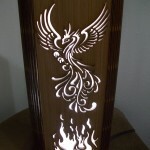 This dramatic table lamp sets the look for a whole room. 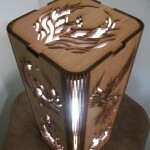 Created with beautiful hand-finished maple or cherry plywood in a oriental style lamp, creating a sense of peace and ease. 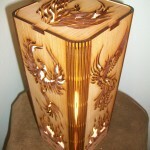 Created with elements of Zen, Feng Shui and oriental design. Excellent for use in pairs on night stands or living or den/library end tables. The lamp is cut from a single piece of veneer plywood with your choice of natural, cherry wood, or indigo stained finishes, with unique laser cuts creating the flexible hinge / bends allowing the lamp to wrap. 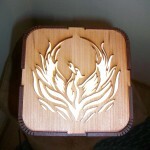 The design is cut on three sides and the top. 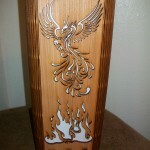 The sides have a different phoenix design from the front. 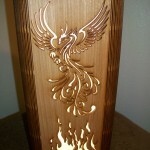 The lamp stands ~11 1/2″ high and ~5″ square. 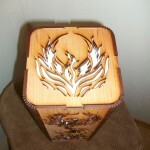 The laser creates a beautiful burned edge effect which creates a wonderful patina unique to each piece. The lamp comes with a 6 ft. cord with U.L. listed components; molded end plug has polarized prongs and a quality rotary switch about 18″ from the lamp. The bulb socket fits a candelabra size bulb (C3 base – not included). Because of temperature precautions, I recommend a maximum 25w incandescent bulb. The preferred bulb would be a CFL (compact fluorescent) or LED bulb, either which is much cooler and energy efficient and can be up to 60w equivalent. You can see examples here: See Sample Bulbs. 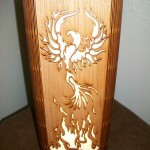 As with all natural, real wood products, there will be slight coloration changes and grain changes between each lamp.